If you're driving to work one morning and you see a 52-year-old man in a suit and tie on roller blades stopped at a red light, don't worry, it's not the caffeine. It's likely just Pitt Meadows' municipal administrator Ken Wiesner doing his part to relieve rush hour traffic congestion. Approaching his fifth anniversary with the municipality of Pitt Meadows, the Unity, Sask. native puts into practice what he preaches each and every day: "Dare to be different." "I'm sure some people think I'm a little off the wall, I'm sure some people think I'm really off the wall. And there are some people who just laugh. "I rollerblade by the mayor's office and he laughs. I like to have fun... and I like everyone who works here to have fun," said Wiesner, whose youthful attitude blends in nicely with the West Coast Lotusland image. In a 30-year career that has taken him to Biggar, Sask. ; Lloydminster, Alta. ; Regina and Trail, Wiesner has gained an invaluable perspective of on-the-job harmony - it's called trust. "I can't speak about people before me, but I think if you walk through the hallways of municipal hall now, you'll notice how relaxed and loose our people are," said Wiesner, who challenges those around him to break free from the conservative constraints of a traditional workplace. "When you have harmony, and everyone's oars are in the water at the same time, that's when work becomes fun." Wiesner compares his task of being the bridge between council and staff to that of a "broker". Investing in the people around you, said Wisener, is the best investment anyone could ever make. A master of motivation, he'll try any trick in the book - and some not published - to strengthen the family bond at municipal hall. His coworkers will certainly attest to that. "Did you know he likes to jump on desks a lot," asked the municipality's director of finance Nancy Gomerich. "One day I was working away at my desk, and suddenly I look up and there's two feet on my desk. Guess whose feet they were. "I remember another time when he came to work dressed up as a hockey player for Halloween. He went around the office body-check-ing the staff. "He strongly believes in a lot of team building. At times I don't think he's tough enough, but the key to Ken is... he cares about people. You see it in him every day." Panning around his office, bookshelves are jammed with books on self improvement "A whack on the side of the head," or, "A kick in the seat of the pants," and, "Lead, follow, or get out of the way." Wiesner prefers to lead by example. Up at 5 a.m. for a workout at a local fitness club, Wiesner's day can often stretch past midnight. He admits it's important for him to absorb as much education as possible. No doubt, Wiesner is the Czar of Seminar. As an administrator, it's also his responsibility to help council members "envision" the future - now. It's his "Proactive approach", that Court. Don MacLean says keeps council's perspectives positive. "He's very much into the motivational gurus," said MacLean, who admits Wiesner is definitely cut from a different cloth. "At times you can vision yourself to death, but he's very energetic about it. "It's tough being an administrator. You're always walking a fine line. I would say Ken is probably more of a consummate politician then any of us (council members)." 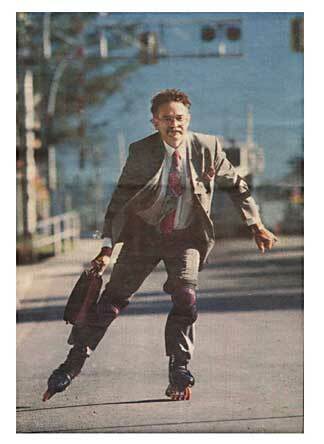 So, the next time you spot a suit and tie in rollerblades, don't ask yourself, "What's he been smoking?' Rather, give him a honk on the horn and a friendly Pitt Meadows wave - it's just your municipal administrator on his way to work.